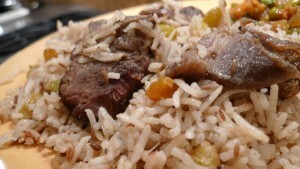 Gosht Pulao recipe by Shumaila at DesiRecipes.com. In a medium pan put peeled garlic , ginger and one onion . Add meat, garam masala, salt and water. Let cook for 1 hour or until meat is tender. Drain and save the soup. Seperate meat from rest of the ingredients. In a seperate pot take the other onion and fry in oil until onion is medium brown. Add meat, cumin seeds , salt and the chillie peppers. Let everything cook for five minutes. Then add 3-1/2 cup of drained soup and let it come to boil. Add rice and let cook on medium heat until the water is no longer visible. Turn heat to low and let simmer for about ten minutes. pakistani recipes of plao are my favt :) !!! !